To kick start our year in the making series, we wanted to take a deeper look at the detail and length of consideration we put into our products. We thought we'd kick it off with our pioneering watertight cool bag. When we sat down and added ideas into the pot on what we wanted out of a bag, we decided that just keeping our food cold wasn’t enough, we needed something as adventurous as the owner. We wanted a bag which was tough enough to throw in the back of the car or boat, yet still hold its shape without ripping. It needed to carry additional items for users loading up for a day at the beach whilst being tough enough to withstand the elements, as well as being super light. It’s a tall order but our design team certainly delivered a contender. 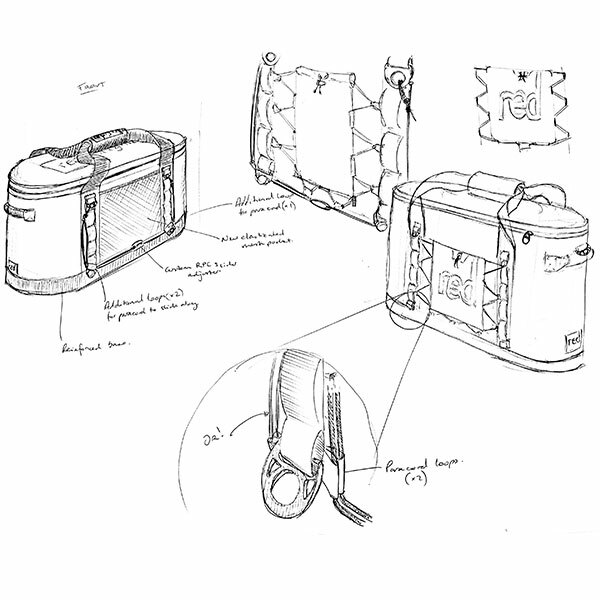 Here’s how we created the watertight cool bag! During testing the Red Original Cool Bag kept its contents 16% cooler than its closest competitor. The design team developing the LTS system. The cool bag needed to be a go everywhere product, if its users wanted to take it to the beach they could, if they wanted to attach it to a paddle board or store it in a canoe then no problem. We wanted the coolbag to go on every adventure, in true Red style we didn’t feel you should compromise where you choose to explore. 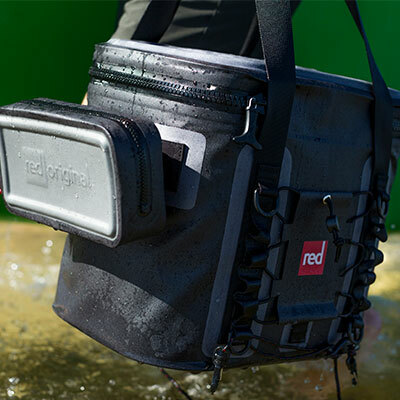 One glowing feature of the coolbag is that it’s completely water tight. We had to invest in a quality zip that could handle such a varied environment. That’s how the YKK Aqua seal zip arrived on the scene, which is a popular choice for dry suits and other waterproof apparel. Not only did the zip need to keep dirt, sand and water out but also from warm air getting in. After all nobody wants a sweaty sandwich. 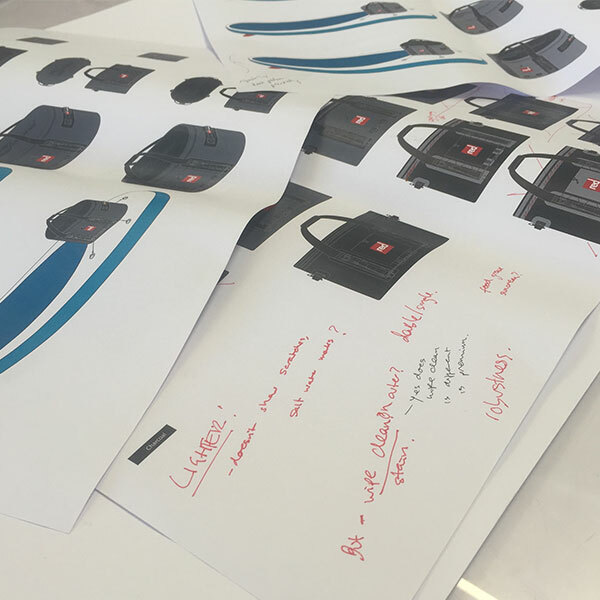 "When designing the cool bag it quickly became apparent that its not just cool stuff that people wish to take on their adventure. Sun cream, bottle openers, baby wipes even binoculars were just a few things our demographic showed an interest in taking with them." Phil - Head of Design. On top of the cool bag being completely waterproof it also needed to be stylish and user friendly. We added outer pockets for those quick grab and go items such as a paddle cap or sun cream. 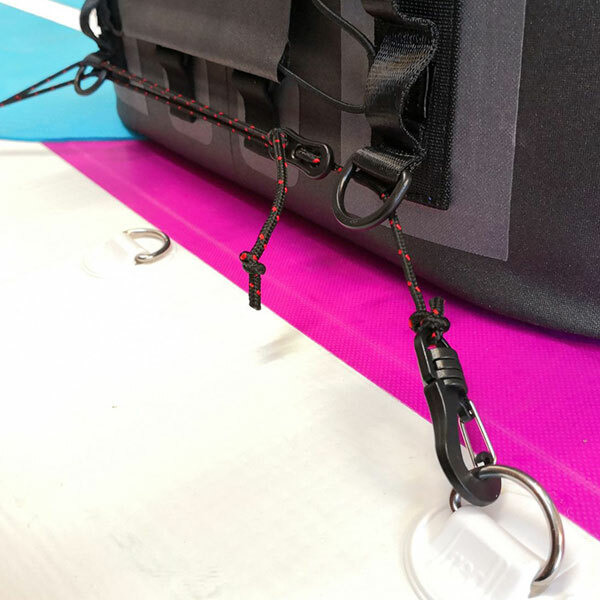 The additional wave webbing loops allow the user to customise the bag to attach handy items to. Easy access was the aim of the game with our cool bag. It needed to be easy to secure and fasten to a board, boat or anything you may be using. 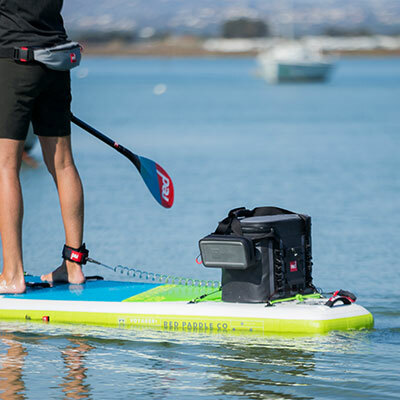 The LTS (Patent Pending) allows the user to attach a coolbag to a paddle board easily and simply. 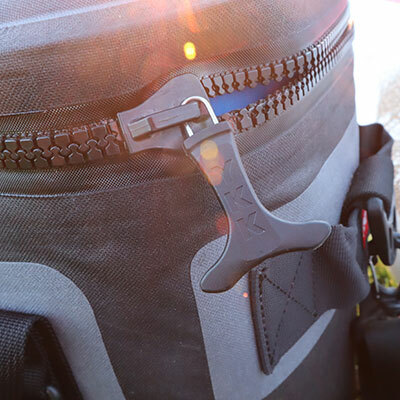 Allowing you to carry the board with a loaded cool bag attached. The beauty with this system is it's fully functional on any board or boat that has a 4 point attachment system. Making it incredibly easy to clip on and go. Just like all of our products we’ve designed them from the gorund up and the armour tech fabric was no exception. We needed a fabric that was tough enough against knocks, drops and being carried to various adventurous locations. We couldn't find a suitable fabric that was up to the job so we created our own. We chatted to Lewis Durant our Industrial Designer “This structural laminate is intended to sustain vigorous repetitive use, making this product not just another fad that will need replacing each season. Whether your on the water, in sticky estuary mud or transiting over concrete slipways, the cool bag will sustain time and time again". It’s all well and good adding some nice features but the bottom line is does keep your ice cold? Our Thermal-Lock insulation enables ultimate insulation keeping the contents nice and chilled. To ensure our cool bag went the extra mile we added an extra thick lid adding 2 inches of thermal lock insulation. 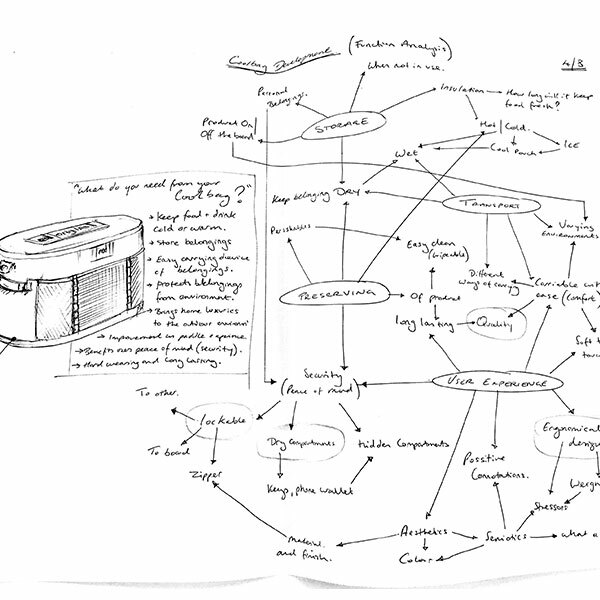 Testing is an important process when designing any product. We needed to see how it lined up against others available. We found 3 popular cool bags and boxes to see how they compared against our Red Original 18ltr Cool Bag. To create a fair and equal test we decided to freeze 4 1.5 litre bottles of water and periodically weigh them to see how much of the ice had melted over time. After 24 hours we found that in the day to day hard shell cool box and back pack cool bag the ice had completely melted. In comparison only 73% of ice had melted in the Red Original Cool bag and it's closest (more expensive) competitor, 94% of the ice had melted during the same period. This makes our bag 21% more efficient than its closest competitor, and 40% cheaper. Size is everything, if we made the coolbags too big they would be awkward to carry. Too small and you can hardly fit anything inside. After extensive market research the team discovered the perfect sizing solution. The fast and light 18ltr home to 22 cans, ideal for day trips for couples or the solo adventurer. The easy carry strap was essential for throwing over the shoulder when you’re on the hunt for that perfect picnic spot. It’s bigger brother at 30ltrs held ample room for the family days out or the overnight camping trips. Holding a whooping 54 cans the 30ltr is perfect for trips where you need to keep food and snacks nice and chilled for any length of time. 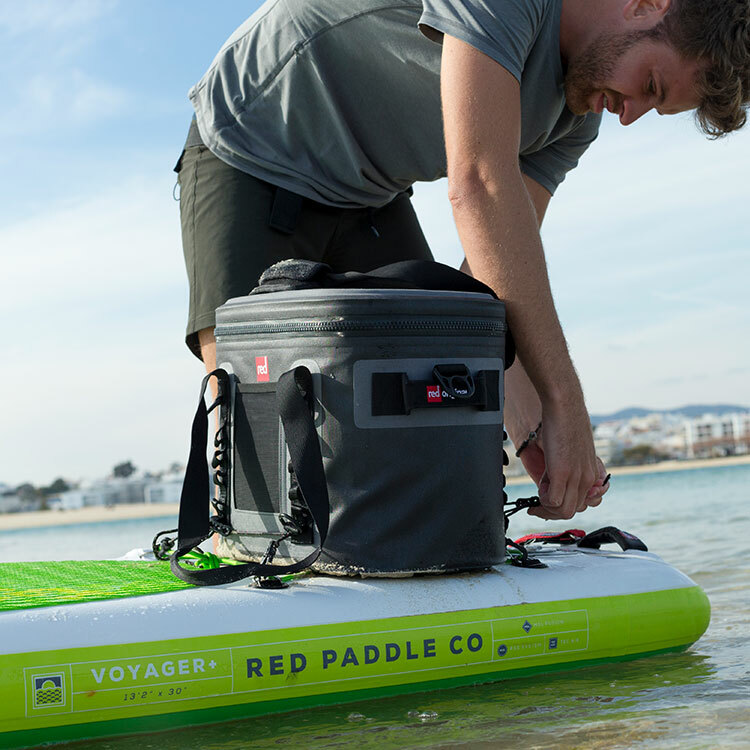 The Watertight Coolbag is ready for you to explore, sail, swim and sup. 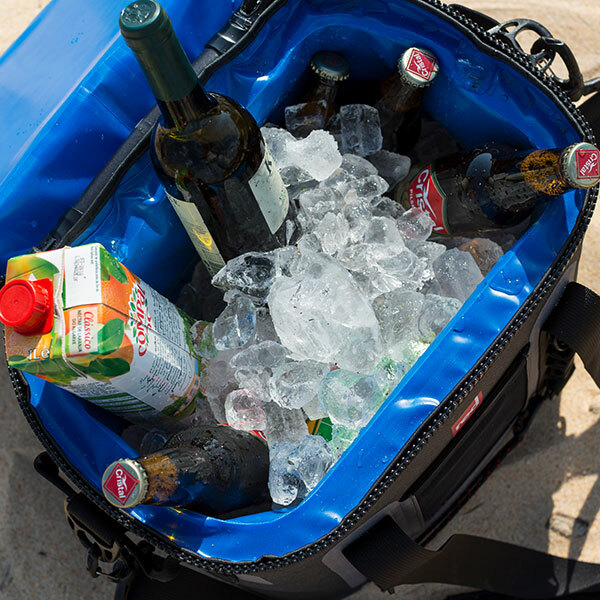 It's well thought out additional features with it's ability to keep items cooler 21% more efficiently than it's competitors makes our cool bag hard to beat! Our high performance coolbag is a real game changer, keeping your contents colder for longer than you thought possible. 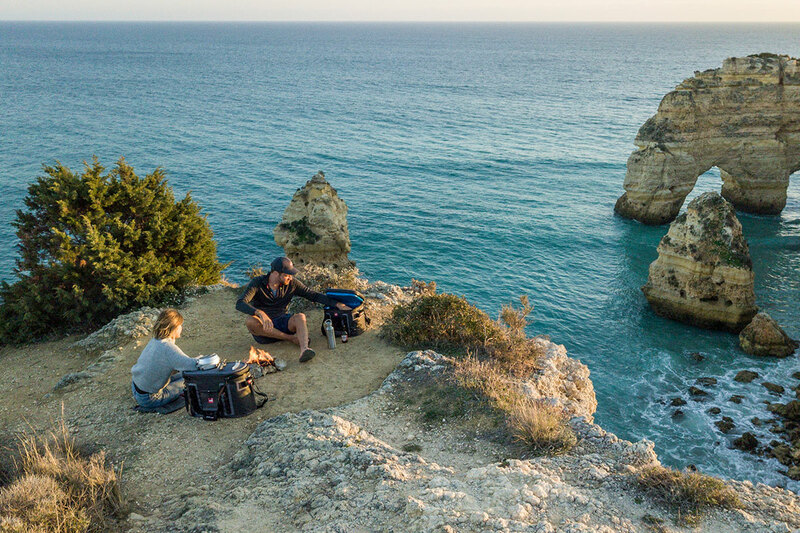 Whether you are using it for an ultimate SUP expedition, picnic, day at the beach, festival, camping trip, road trip or any other adventure, our ultra-durable coolbag will deliver time and time again.